A boy took his donkey along the edge of a potato field in central Bamian Province, Afghanistan, on a road that leads to the nation’s largest iron ore mine. 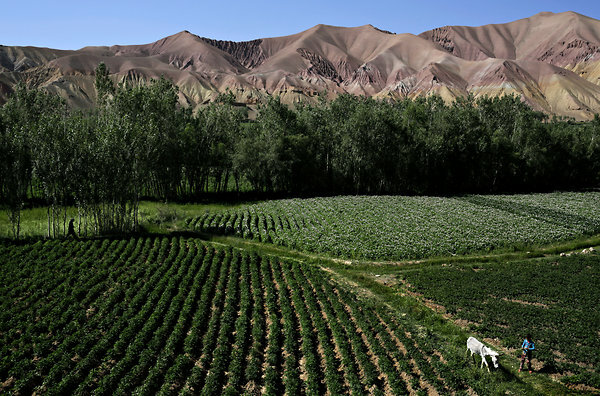 BAMIAN, Afghanistan — The war has finally found Bamian, a remote corner of Afghanistan that for a decade had enjoyed near immunity to Taliban violence. As the American troop surge peaked over the past two years, Taliban insurgents began contesting parts of this central province, flowing in from more embattled areas of the country. And now, a series of deadly strikes in recent months has intimidated residents and served notice that roads are unsafe and government officials are targets. That it has happened in Bamian — known for its rugged beauty, nascent skiing industry and the ancient Buddha statues that once kept vigil here — has added to the sense that nowhere in Afghanistan can be considered safe. And that, Afghan and Western analysts say, is a crucial part of the Taliban’s strategy in coming here. Despite years of international military efforts, the Taliban have continued to show that they can drift away from Western forces and carry out attacks elsewhere. And now that the surge is over, and the force of 68,000 American troops is scheduled to withdraw by the end of 2014, the Taliban’s resilience has raised stark fears about what will happen next. By contesting the roads into Bamian, the insurgents have added to the sense of encirclement of the Afghan capital, Kabul. These barren valleys and high passes are just a few hours from Kabul by car, but now the roads are nearly impassable for foreigners and dangerous for most Afghans. On the roads into Bamian, the Taliban now regularly descend from the hills at night in shows of strength, setting up their own checkpoints after local police officers have left. They take those opportunities to rob, or kill, travelers, local officials say. And they regularly carry out deadly incursions into Bamian itself, particularly in a section of its northeast. Such attacks, including the abduction and killing of the provincial council chief last year on the main road to Kabul and the deaths of 14 coalition and Afghan soldiers over a few weeks this summer, are collectively the worst spasm of violence in the region’s rocky valleys since the Taliban’s fall in 2001. Few suffered as much at the Taliban’s hands as the Hazara, the moderate Shiite ethnic minority that makes up most of the population in Bamian Province. They were massacred by the thousands during the civil war and the ensuing reign of the Taliban, who are mostly ethnic Pashtuns. Before their ouster, the Taliban also destroyed Bamian’s most famous landmarks, two giant Buddhas that had gazed across the rough plains from their honeycomb sandstone hills for 1,500 years. Their ruins stand as a reminder of the cycles of devastation that have swept this region. In the years since, the Hazaras have established an island of relative stability behind Bamian’s high mountain borders. Fields of potatoes and wheat stretch across basins and adorn hillsides. And though the population as a whole is quite poor, education levels for girls are among the highest in the country. The provincial capital, a bazaar town of stalls and marketplaces where farmers sell watermelons and plums, and its surrounding areas have remained mostly peaceful, officials say. But even here, the insurgents have sympathizers. And the people of Bamian worry that the violent tremors that have begun here point to more troubling times ahead. According to Mohammad Aziz Shafaq, head of Bamian’s provincial council, fear has begun constricting both their livelihoods and lives. In July, gunmen killed an American engineer traveling on the Kabul-Bamian road. In September, five Hazaras were killed on another connecting road through Wardak Province. The main Hazara political leader has been targeted in attacks. And this month, a girls’ school was set on fire, and the convoy of one of President Hamid Karzai’s deputies was attacked. Residents in Bamian have held protests, gathering in front of the governor’s office to demand action. As the noose tightens, even the police have sought help in traversing this newly dangerous landscape. Most of the insurgents seem to be moving in across Bamian’s eastern and northeastern borderlands from the neighboring provinces of Baghlan and Parwan, especially Baghlan’s Tala Wa Barfak district, officials say. These provinces have a longer history of unrest, pointing to a broader problem in this central region of Afghanistan. While coalition and Afghan officials say the insurgency has brought much of the recent violence, as the central provinces have become arteries to transport fighters and weapons, it is not just the Taliban who are behind the attacks. In some cases, criminal groups are at work extorting local businessmen and kidnapping traveling traders. They, too, have been energized by the coming Western withdrawal. Hajji Ashuqullah Wafa, a member of Parliament from Baghlan, said militant groups enjoy the patronage of local warlords who are intent on destabilizing the government and are preparing for a time after 2014 when coalition combat forces are gone and they can extend their sway more widely throughout the region. “They are people who benefit from fighting and war,” he said. For residents here, the most serious signs of encroachment came this summer when two roadside bombs hit Afghan police patrols, and then the longstanding New Zealand peacekeeping force lost five of its personnel in two attacks. In one of the attacks, about 40 New Zealand soldiers were drawn into an unexpectedly fierce and prolonged gun battle when they responded to calls for help from Afghan intelligence forces raiding a compound outside the village of Baghak, in the northwest. “Even the locals were surprised at how it spiraled,” said Maj. Gen. David Gawn, commander of the joint forces of New Zealand. As they consider this violence, Afghan officials concede that they are facing resilient enemies with an ability to move from regions to the south and east of the country, eluding security forces concentrated there. “While our other activities were going on in the south, problems increased in some parts of the north and our enemies concentrated on the north,” said Mohammad Zahir Azimi, a Defense Ministry spokesman, describing the Afghan security forces’ experience at a recent news conference. Coalition commanders contend that Bamian’s instability actually is an indication of success of a sort: they have said that coalition and Afghan forces are compressing the fighting space and pushing desperate insurgents to more remote areas, like Bamian. In fact, the real effects of the surge and the continuing drawdown of the war in these final years may not be known for some months, other analysts say. They suggest that the new troubles and insurgent advances in Bamian may be a disturbing revelation that the Taliban fighters are not as weakened as some hope. “It is another step forward in their general expansion in the north,” said Thomas Ruttig, co-director of the Afghanistan Analysts Network, a research organization in Kabul, who said the surge had not changed conditions as much as the international coalition would have liked. Habib Zahori contributed reporting from Bamian, and an employee of The New York Times from Kabul, Afghanistan.